In the case of our Yellowhead Tour, the lead-in is as unique as the bike ride. 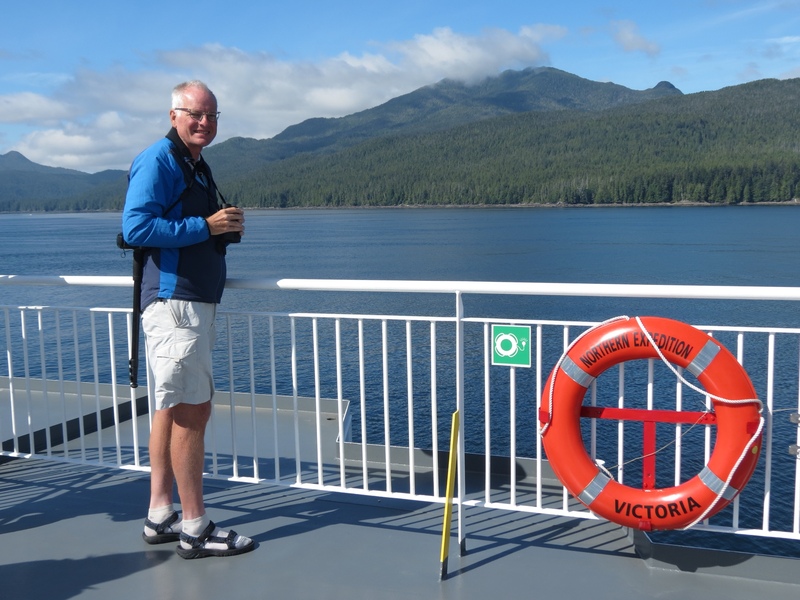 From our family vacation on the Olympic Peninsula, the first leg takes us to the northern tip of Vancouver Island. 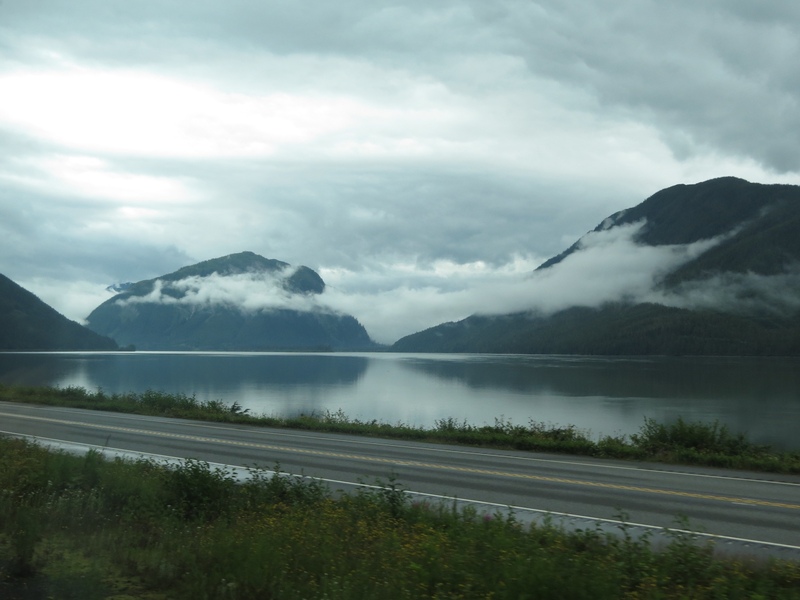 As we drive, distant mountain ranges and snowy peaks stretch the length of the mainland. In front of the morning sun, their ghostly forms float eerily over the water. With each mile the remoteness increases as the pine forested mountains press in on our road. We have enough time for a pleasant morning bike ride in Campbell River. 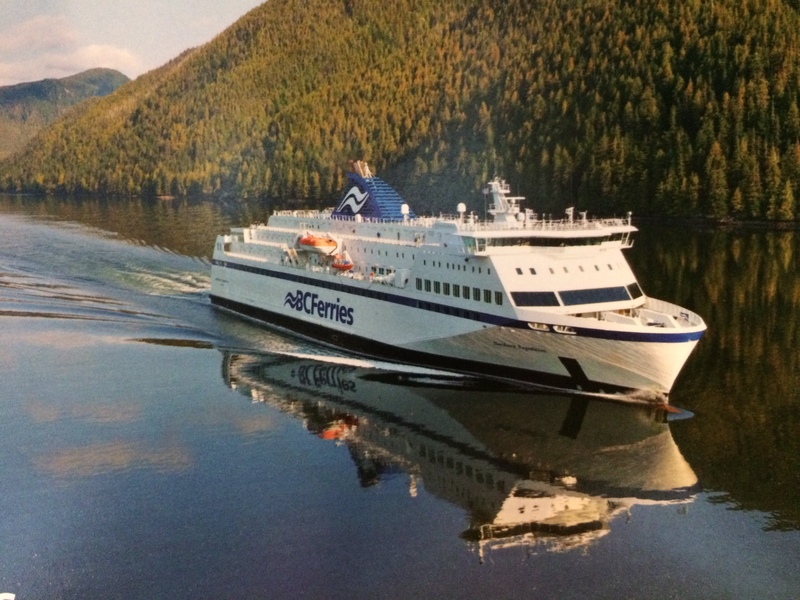 Early morning in Port Hardy finds us in line for BC Ferries, to take the Northern Expedition to Prince Rupert, British Columbia, just 15 miles south of the Alaskan border. 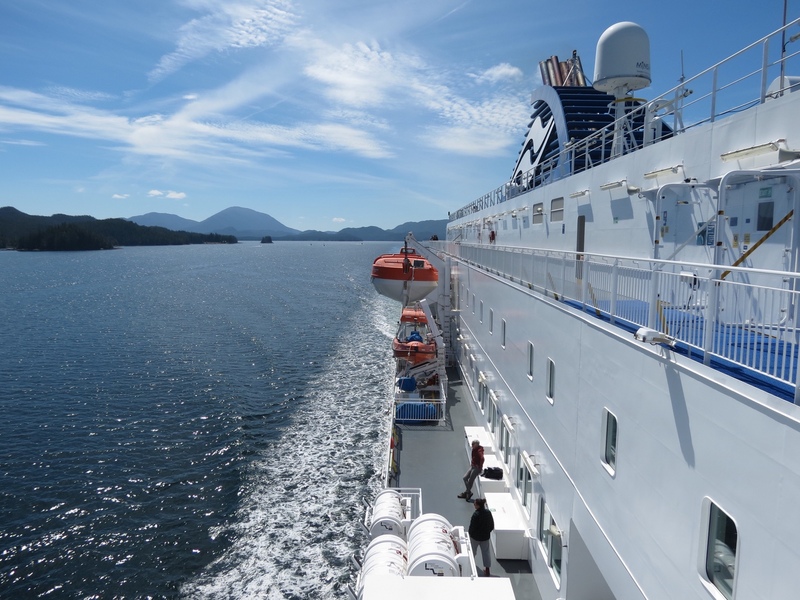 It is a brand new ship, exuding efficiency and modern conveniences – quite different from the vessel we took for this same excursion 30 years ago. 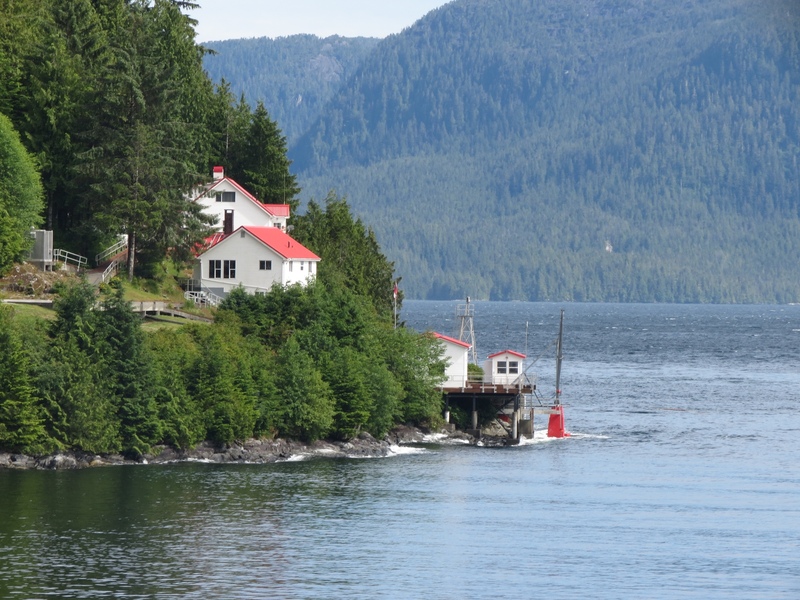 We are captives for 16 hours as the ship sails through the inland passage, a calm narrow route through the mountainous coastal islands. The morning clouds and chill burn off to reveal a sunny day. Soon passengers alert one another to whale sightings, and we flock to the spot to catch sight of the spectacle. Orca blow sprays, breaches and tail fins are most common, and with the help of Rich’s binoculars I get some good views. It’s more than I’ve seen before, so I’m pleased with the experience. Then we get a real show. An orca jumps out of the water, exposing his whole body to view except his tale. While we are still reveling in our luck, he does it again. And then again! Too far away to get photos, we take joy in the sight as it happens. I also see an otter. A more knowledgeable passenger informs me that he is eating as he floats on his back. It feels like an adventure cruise, and I bask in the sun as I eat my lunch out on a deck chair. Clouds roll back in as the day progresses, and daylight ultimately fades to darkness. It is 11:30pm by the time we drive off the ferry. A mere six hours later we will be up and moving again. 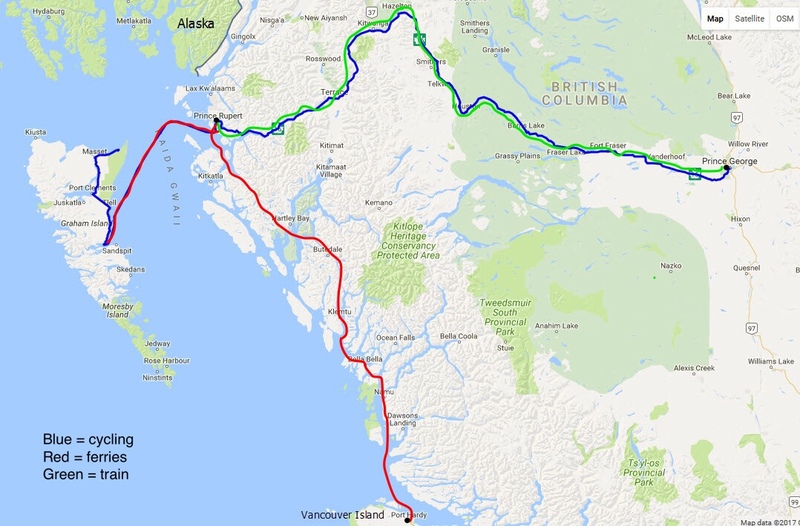 It is time to abandon the car, one step closer to bike touring. We cycle our first 1.3 miles to the train station in the damp cloudy morning dimness. There we are greeted with good news. This VIA Rail train has a roll-on baggage car for bicycles. Since it was a possibility but not a guarantee, we sigh with the relief of being spared a last minute frenzy boxing our bikes. 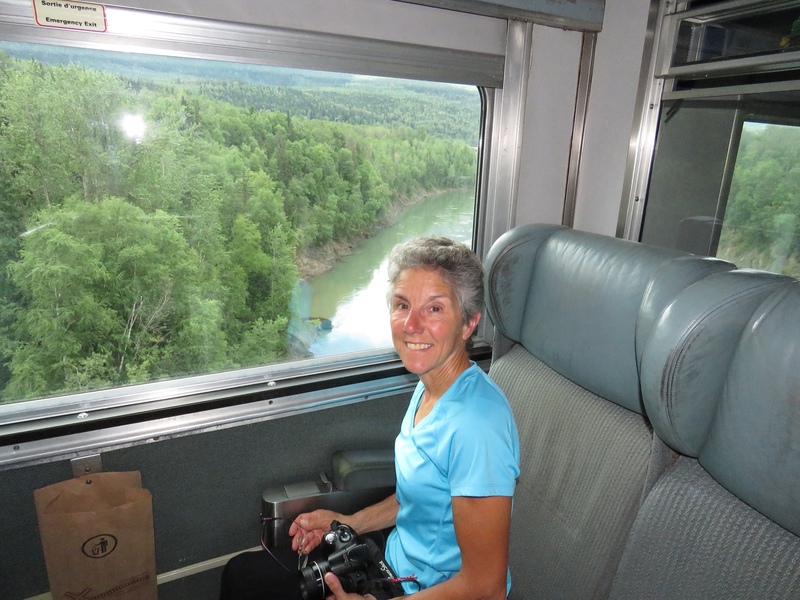 With a tip from the baggage handler, we score seats on the right side of the train with a full window view. 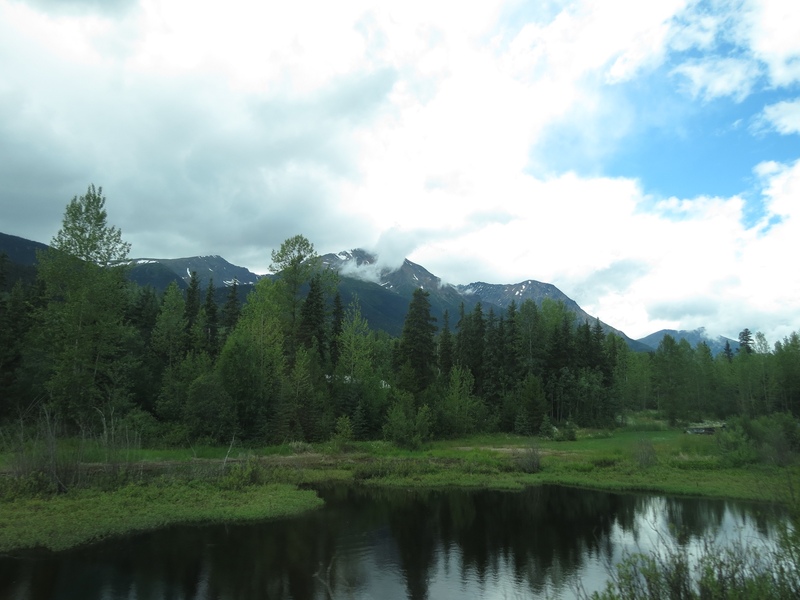 We follow the Skeena River, which lives up to its meaning, “misty river.” But as we move inland, the clouds lift to nearly clear the tops of the mountains we pass, and frequent bursts of sunshine enhance the views out our window. A companionable voice comes over the PA system periodically to alert us to upcoming views and fill us in on the history we pass. The mountains are a constant, green forest or rocky with glaciers. Rivers, wildflowers, lakes and occasional towns populate the foreground. When we get only a fleeting glimpse or the sun doesn’t cooperate for a picture, I remind myself that I will be back to see it all again at 12 miles an hour. In contrast to the gleaming ship, the rail cars are old and tired. Going to the take-out counter for coffee feels like an undercover encounter with the cook in the kitchen who is swabbing the floor. Sharing the same space for 12 hours, we can’t help but overhear snipits of others’ lives, and an odd camaraderie develops. My body aches to be active. For two long days, our greatest burst of activity has been the anxious dash to get up at an absurd hour and rush to queue up for the day’s transport. 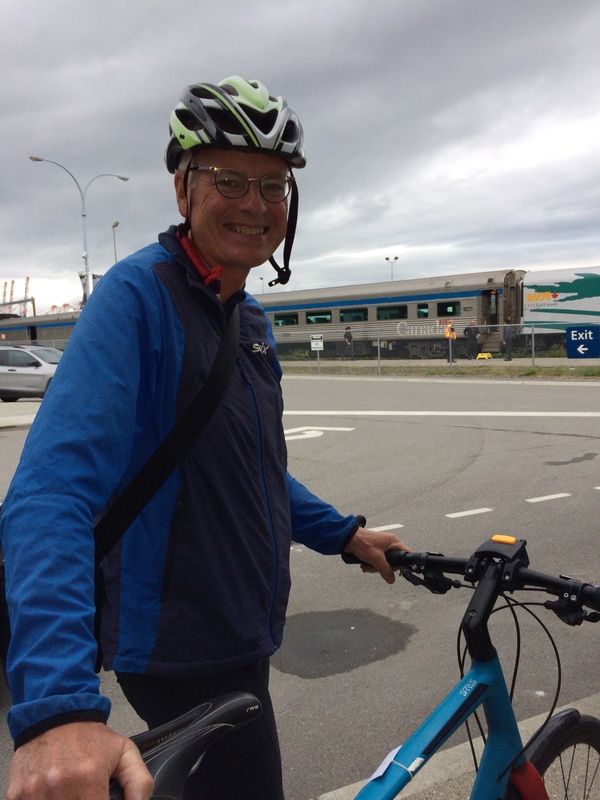 Now that we have reached Prince George, I am raring to hop on my bike and do the whole trip again in reverse. 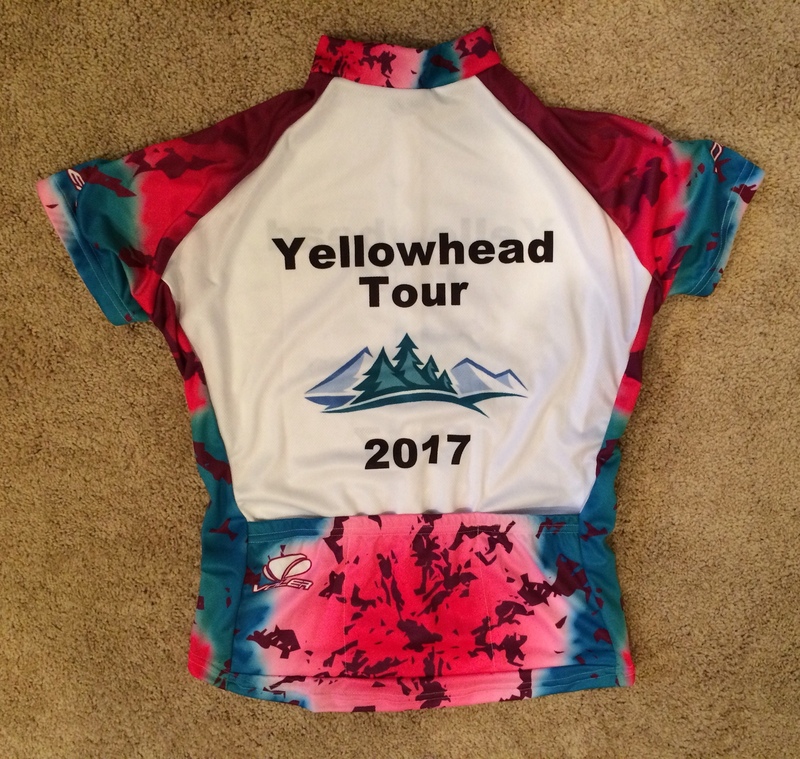 Enough of land, sea and rail travel, it’s time for the Yellowhead Cycling Tour! 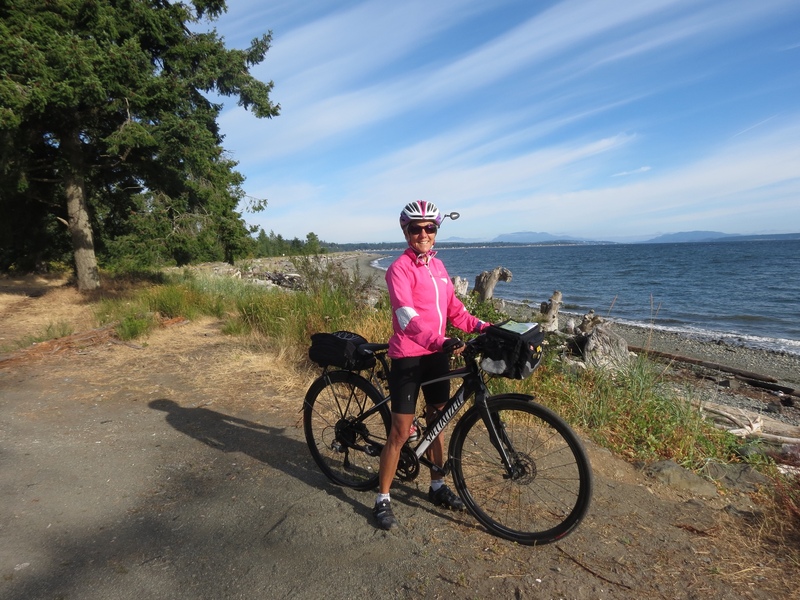 This entry was posted in Travel and tagged British Columbia, Travel, Yellowhead Cycling Tour by Molly. Bookmark the permalink.